The value of an antique secretary’s desk largely depends on wood type, whether or not all of the original hardware is present and the overall condition. Replacement panels, drawers or hardware significantly lowers the value. Antique secretary’s desks were made in numerous sizes and styles including Chippendale, Victorian and French. Typically these desks were made from hard woods like oak, walnut or mahogany, which were known for their durability. 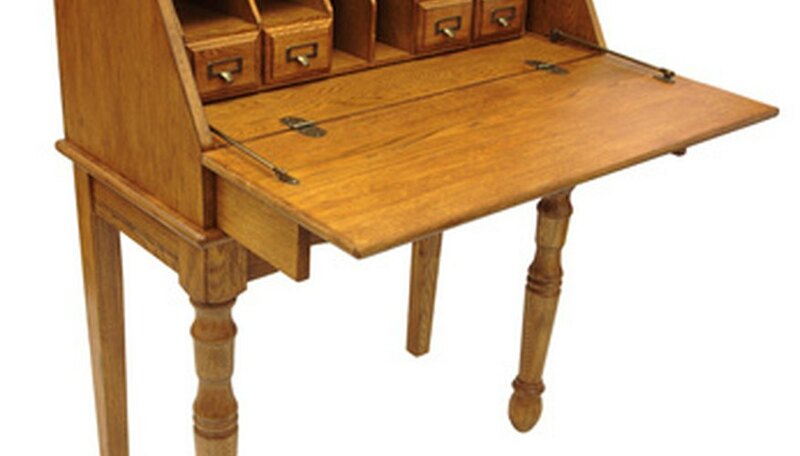 An antique secretary's desk usually has a small hutch or bookcase on top, drawers and a pull-down writing area that hides smaller drawers and cubbies in its unused position. Some styles come without the bookcase on top. With their popularity on the rise, antique secretary's desks are becoming increasingly valuable, especially those with historical significance or for which the provenance (origin) is known. The desks are highly sought after by collectors and can be quite expensive. Authentic antique secretary’s desks range in value from $500 to more than $30,000, but you may be able to find one at an online auction site or a local estate sale for $200 to $400. Replicas of antique secretary’s desks are much less expensive than authentic pieces. They can be just as attractive and are readily available.